Perforated aluminum has a strong resistance to corrosion due to an oxide skin formed in reaction with the atmosphere. It is a relatively light metal compared to metals such as steel, nickel, brass, and copper and is rather malleable. It can have a wide variety of surface finishes and is highly reflective to heat and light. For most applications, perforated aluminum sheets need no protective coating but are often anodized to improve color and strength. 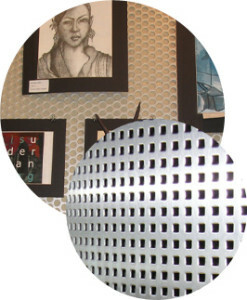 Perforated sheet aluminum is extremely useful at low-temperatures. At subzero temperatures its strength increases while retaining ductility. At temperatures over 400F aluminum alloy sheets tend to lose some of their strength. H14 Pure aluminum (.99% min.) is highly resistant to attack by chemicals and rural, industrial and marine atmospheres. Easily worked and ductile enough for deep draws. For general use in applications where the essential qualities of aluminum will be beneficial. H14 The most widely used general purpose alloy. Stronger than 1100 but still readily formable. Excellent resistance to chemicals and weathering. Recommended for general use where the extra strength is required. 5050–H34 Very similar to 3003 in physical properties and corrosion resistance though slightly lighter. Recommended for anodized applications for best match with extruded aluminum components. H34 A versatile alloy for applications requiring greater strength. Readily formed, very good corrosion resistance. Recommended for applications requiring high strength and formability. H34 Recommended for welded assemblies requiring both welding efficiency and high joint strength. Good corrosion resistance. Typical applications include pressure vessels, marine super-structures and transportation equipment.